Virtual Ability, Inc. welcomes guest blogger Nicole Matyas, OTS, as she shares her thoughts about the session entitled “The Role of Counseling in Quality of Life and How Counselors are Exploring Virtual Service Delivery,” presented by Christine Karper, Ph.D. and Michelle Stone, B.S. 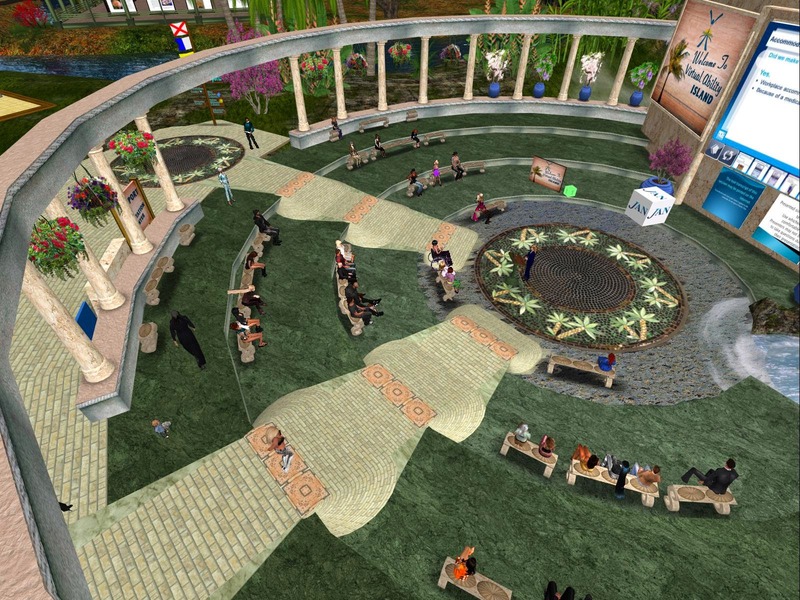 Psychology, both from the College of Social Sciences, University of Phoenix, during the 2014 Mental Health Symposium sponsored by Virtual Ability, Inc. in Second Life®. Ms. Matyas (SL name nicki416) is a Thomas Jefferson University student in the Department of Occupational Therapy. The following represents Ms. Matyas’s opinions and insights and we appreciate her sharing them. This lecture addressed how the emerging use of technology in providing human services is implemented, specifically in counseling through the use of virtual worlds. Karper and Stone opened their discussion by reviewing the traditional measures by which counselors typically treat their patients by utilizing the “disease approach” as a basis for treatment. Counselors tend to serve as “pathologizers” in treating their patients, by being trained to hone in on the negative symptoms that inhibit the daily functioning of individuals with mental illnesses. They are constantly looking to merely reduce distress and illuminate what is wrong. However, by shifting to the up and coming “well-being-focused” approach, counselors may execute a larger focus on patients’ strengths in addition to repairing deficits. Dr. Christine Karper, Ph.D. presented using her avatar "Storm"
According to American psychologist and author Dr. Martin Seligman, this more optimistic, well-rounded approach is deemed as “positive psychology.” Positive psychology focuses on the whole person, where happiness is understood in relation to goodness and meaningfulness. Individuals may reach this goal by engaging in more activities that evoke positive emotions and practicing skills that will help to further develop their strengths. It is the role of counselors to educate their clients about strategies that can be used to incorporate their interests and preferences into their daily routines as a means of improving their symptomology and obtaining an overall sense of well being. Karper and Stone specifically mention the significance of the flow experience, in which individuals are so immersed in an activity that they lose track of time due to the perfect fit between their abilities and the challenge of the activity at hand. This flow experience provides individuals with a sense of meaning and larger purpose. This sense of meaning has the strongest effect on individuals' level of satisfaction with their lives and encompasses so much more than what the traditional symptom-reduction approach would. Rather, this approach emphasizes talent and improvement in overall quality of life. Moving on to actual interventions, Karper and Stone introduced a subgroup of the American Counseling Association (ACA), the Cyber Task Force, and described how that task force is working to make positive changes in service delivery by encouraging the use of technology. Resources include providing support to those counselors and educators who wish to include technology in implementation of practice. This group also has a Code of Ethics to aid in legal and ethical issues faced by practitioners. Ms. Stone presented using her avatar Bellastormi Constantine. The benefits of technology include enhancing communication, learning, and increasing the ease with which we do things. The task force has also developed a standard of competencies and identified practical implications of technology in counseling. To further develop the field of counseling, virtual worlds can be used for hosting support groups in a non-threatening environments as well as in providing the immersive, flow-like experience without the negative repercussions of the real world. Virtual worlds also promote acquisition of various skill sets that may be generalized to real world situations. A personal anecdote by a member of the audience was then shared that I found quite interesting, and that was that a simple adaptation of technology allowed an individual with psychosis to reduce his sense of stigmatization. This was by wearing a blue tooth device in the community as a means of compensating for verbally responding to the voices in his head. His behavior suddenly became normalized, demonstrating that simple implementations of technology such as this really can help! Between 45 and 65 people attended each of seven presentations. The part of this lecture that really stood out to me was the acknowledgement of the importance of the flow-like experience. As occupational therapy students, we are constantly challenged to strive for providing opportunities for our clients to experience flow. If clients become so immersed in meaningful activities that they lose track of time and obtain a sense of complete mastery over a skill, perceived sense of increased self-efficacy is reached, leading to overall increased levels of satisfaction and quality of life. As an occupational therapist in training, I found this lecture to be extremely interesting and also reflective of the direction in which all human services are moving, including advancing to the use of more advanced technologies, such as in virtual environments.